Wheelersburg playmaker Makya Matthews attempts to break a tackle in the Pirates regional final win over Madison on Saturday. Wheelersburg quarterback Trent Salyers had 244 passing yards and three passing touchdowns in the Pirates win over Johnston-Monroe in last season’s regional final game. 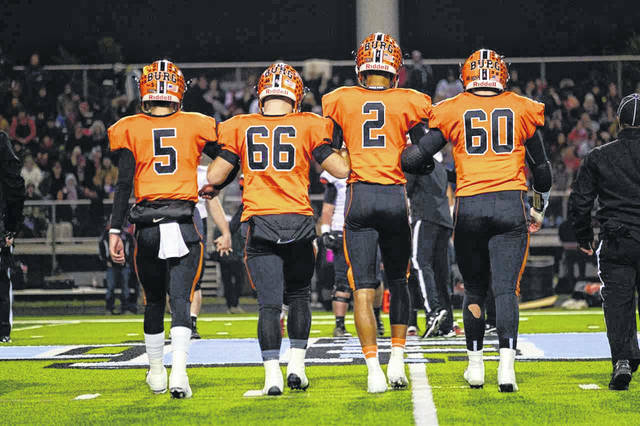 Wheelersburg captains approach midfield for the coin toss prior to the Pirates regional final game with Madison last Saturday night. 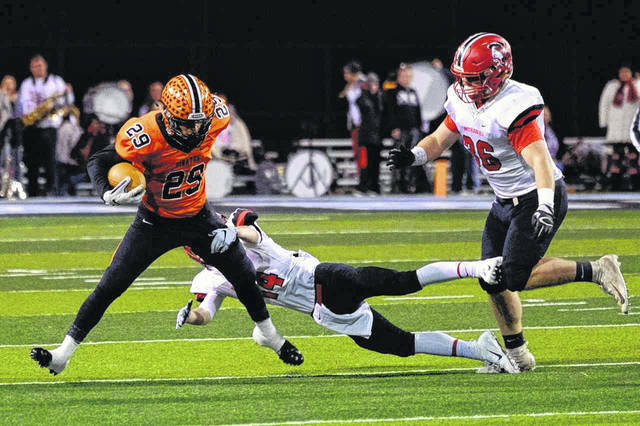 After a week of discussion and speculation surrounding the events of the Division V Region 20 championship football game, the Wheelersburg Pirates will now prepare to play, as they have since their win over Madison last Saturday 24-16, against the Johnstown-Monroe Johnnies in the Division V state semifinals on Saturday night at Alumni Stadium in Jackson. A year ago, as was the case with Madison a week ago, the Pirates squared off against the Johnnies in route to their second state championship and first since 1989. In that game, which was coincidentally the Region 19 championship prior to their state semifinals game vs. Madison, Wheelersburg very handily defeated Johnstown-Monroe by a final score of 34-7. The Pirates held a 28-0 lead at the halftime break thanks to two touchdown passes from Trent Salyers to Tanner Holden, one in each quarter, and also a rushing touchdown each by Dominic Reyes and Evan Horsley. Salyers completed his third touchdown pass of the game to a then sophomore Makya Matthews in the early stages of the fourth quarter, but Jalen Miller’s extra point attempt was blocked, giving the Pirates the 34-0 lead, essentially sealing the Pirates date with their second state semifinal game in the past three seasons. Johnstown-Monroe’s only touchdown of the game came near the end of the fourth quarter when quarterback Jason Walters completed an eighteen yard touchdown pass to Jared Orders to cut their deficit to 34-7 in what would remain the game’s final score. Salyers finished the Region 19 championship game completing 73% of his passes for 244 yards and three touchdowns en route to the Pirates win. In Wheelersburg’s regional championship game with Madison, the Pirates defense played spectacular start to finish in a high pressure situation. Their offense had an outstanding second quarter which resulted in their scoring all 24 of their points in that period while on their way to a 24-16 win. Also in their regional final game, both Wheelersburg and Madison were plagued by penalties. In that game, both teams combined for 23 penalties for 223 penalty yards. And those numbers were not one sided in either way. The Pirates themselves were responsible for 11 penalties and 102 total penalty yards. For the Pirates to be able to come away with a victory in their third state semifinals appearance in four years, and to reach Canton and contend for back to back state championships, the same defense that has played at an incredibly high level for the last thirteen weeks will have to show up to try and stop the Johnnies daunting rushing attack, as well as their discipline will need to improve to help limit penalty yardage. As mentioned above, Johnstown-Monroe has a highly efficient rushing attack that, as a three-headed monster, has combined to rush for 3,515 yards on 513 carries for 44 touchdowns rushes on the year while on their way to a 12-1 record, the same as Wheelersburg, heading into week 14. Those members of that three-headed monster rushing attack are senior quarterback Caden Calhoun who has rushed for 1166 yards on 151 carries and 10 touchdowns, senior fullback Luke Myers who has rushed for 778 yards on 108 carries and 15 touchdowns, and the leading rusher for the Johnnies, running back Bryce Barasch who has rushed for 1571 yards on 254 carries and 19 rushing touchdowns. All three leading rushes for Johnstown-Monroe have an average yards per carry of 6.2 yards or higher among the three. Kickoff between the Johnnies and Pirates in the Division V state semifinals game is set for 7:00 p.m. at Alumni Stadium in Jackson. The winner will advance to next week’s Division V state championship game in Canton.